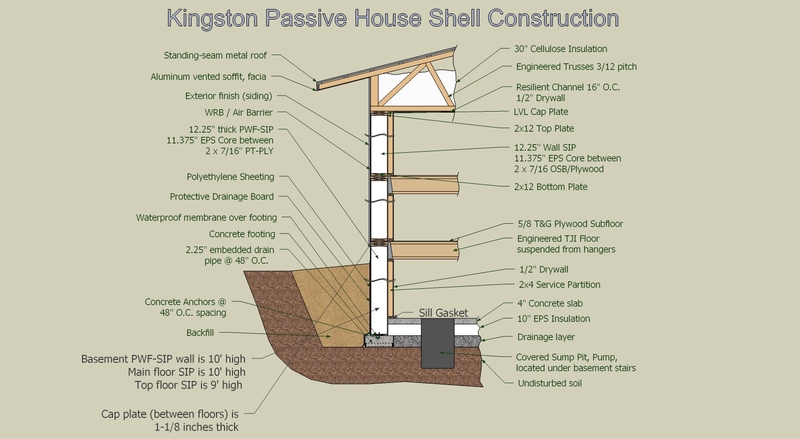 I should start this post with a clarification… There are many wall assemblies that will help a building meet the Passive House standard. The materials you choose (and the quantity) will depend on many factors, including the climate, aesthetics, availability and cost. Once your materials and construction type have been selected, it’s a matter of adjusting the wall thickness in PHPP (the software tool used for energy-modelling a Passive House) until you meet the standard. The exterior walls are only part of the equation – PHPP also takes the windows, floor assembly, air-tightness and much more into account. We chose Structural Insulated Panels (SIPs) for the wall construction due to the minimal thermal bridging, high insulating value per unit of thickness and speed of assembly. In addition to the SIP panels, we have chosen to install a service cavity on the inside perimeter. This is essentially a 2×4 stud wall partition put in place to aid with the installation of electrical and plumbing along outside walls. The sub-trades can drill holes through those studs without compromising the air-tightness and insulation of the SIP panels, both of which are critical in a Passive House. The interior seams of the SIP panels will be taped with a product designed for that purpose, not the red tapes used for detailing vapour barriers and house-wrap. To reduce thermal bridging and greatly minimize potential for air leakage, we are hanging the floors on the insides of the wall assemblies. In typical construction, the floor assemblies are built on top of the walls. This creates a thermal bridge at the end of every joist (engineered or otherwise) and makes proper insulation and vapour barrier installation very difficult. Metal hangers attached to the SIP cap-plate will support the floor joists and greatly simplify our quest for a super-insulated, air-tight building envelope. Note the (almost) continuous insulation layer… it is interrupted only by the top, bottom and cap plates required per the SIP manufacturer’s specification. Also note the unusually high truss design; These raised-heel trusses ensure we’ll have room for the full depth of insulation even at the eaves where a typical house would see a significant reduction. We still need a solution for the sump pit – it’s an obvious thermal bridge in this diagram, so it will need to be dropped down flush with the top of the gravel and we’ll fabricate an insulated lid to seal things up.